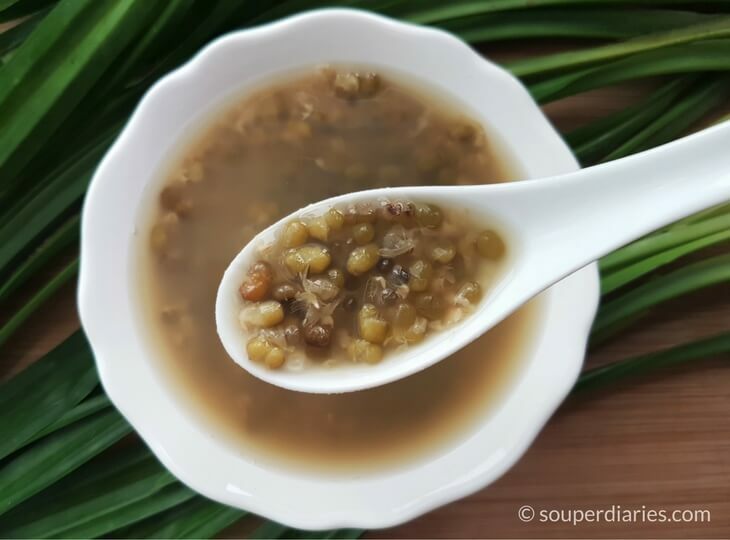 Green bean soup (also known as mung bean soup) is a classic Chinese tong sui (sweet soups). A cooling (yin) dessert, this sweet soup is light yet nutritious and can be taken warm or chilled. Green beans are a good source of fiber and protein and also contain vitamins (B1, B2, B3, B5, B6, C,E, K)and minerals like iron, magnesium and potassium. It is also a traditional home remedy to clear toxins, reduce body heat and promote healthier skin. In perpetually hot countries like Singapore, this cooling drink provide a wonderful relief from the scorching heat and heat-related symptoms like dry skin, headaches and skin rashes. Drinking this soup is a must for me especially during haze periods which seem to occur almost every year in Singapore. As I am writing this, air quality in Singapore has crossed over to the unhealthy range of above 200 P.S.I. so it is good to drink more detoxifying soups like this to flush out toxins from our body. Another detoxifying drink that is very easy to cook is barley water which I often make at home. 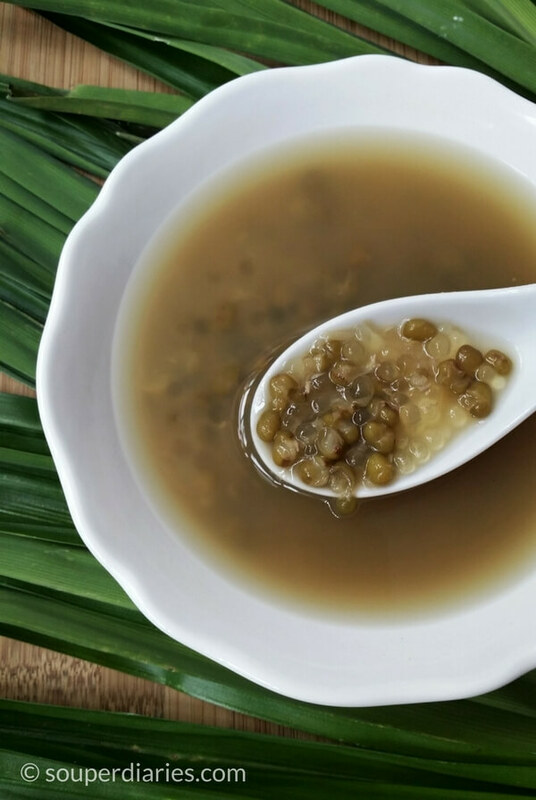 Although green bean soup has many health benefits, it is not suitable for some people. Those who have diarrhea and cold hands and feet should avoid eating green beans. The basic ingredients that you’ll need are green beans, water and rock sugar. Sago pearls and pandan leaves are optional but I find that they really enhance the enjoyment of the soup. Sago pearls are flavorless on its own but once you add it into desserts like this, it gives the soup a smoother and more interesting texture. It also enhances the appearance of the soup, don’t you think? 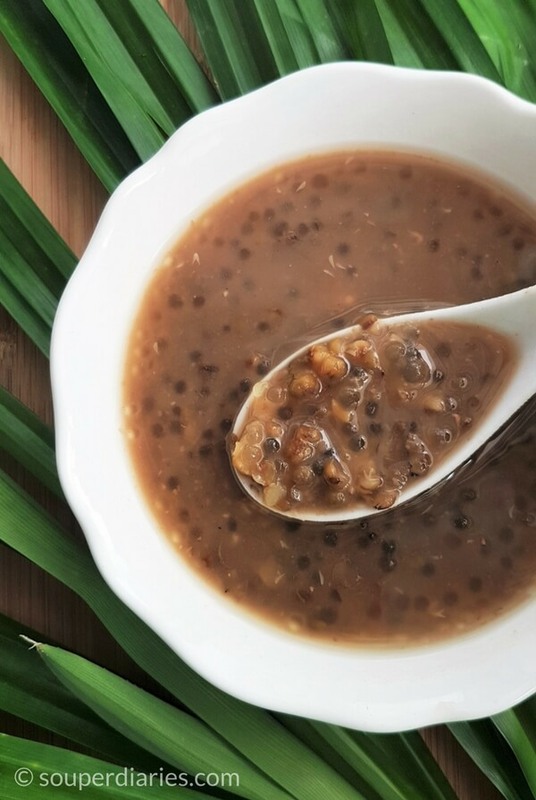 Refer to this post on how to cook sago. Do you like green bean soup with a thicker consistency or a more watery texture? For a thicker soup, mash up some of the softened beans with the back of a spoon against a sieve. Ladle up some soup and pour it through the sieve to let the mashed beans return to the soup. (refer to recipe for full instructions) Simmering for a longer time will also thicken the soup. And if you like a more watery consistency, turn off the heat once the beans have softened and opened up. Another easy recipe for a bean dessert is this Red Bean Soup. Green bean soup with a thick or thin consistency. Which one do you like? If you enjoy soups, check out my Slow Cooked Soups and Quick Boil Soups too. Thanks for reading and happy cooking! A delicious dessert soup to cleanse, detox and cool the body. In a soup pot, add green beans and knotted pandan leaves and bring to a boil. Remove the pandan leaves once it starts boiling, You can also leave it in the pot and remove it when the soup is done but it will be messier that way. If your pot is deep enough you may cover it. Otherwise, partially cover the pot when you simmer as the soup boils over easily. Add in the optional ingredients now if you want to. Simmer for about 45 minutes or until the soup reaches your desired consistency. Add water if necessary. Optional step: If you wish to thicken the soup, place some of the cooked and softened green beans in a strainer over a bowl. Mash them with the back of a spoon so the soft part of the beans go through. Then ladle up some soup and pour it through the strainer to let any remaining mashed beans return to the soup. Pour the strained beans in the bowl back into the soup pot and discard the leftover husks in the strainer. Add in sugar and sago pearls. Stir gently and let simmer for a few more minutes. Turn off heat. Serve warm or chilled. Tip: It is advisable to consume this dessert on the same day. I find that it will turn mushy if you keep it refrigerated till the next day. Hi Yvonne, this green bean soup looks delicious. I would love to try it some time. Any info on the nutritional values? This recipe looks delicious and healthy. I enjoy making vegetable soups. Are you sure you only have to soak the green beans for three hours? I always thought it needed to take longer. Where can I get sago pearls? I have not heard of them. Is there somewhere I can order them online or a specialty store I can go to? Hi Steph, you may soak the beans overnight if you wish but not too long or it will start sprouting. 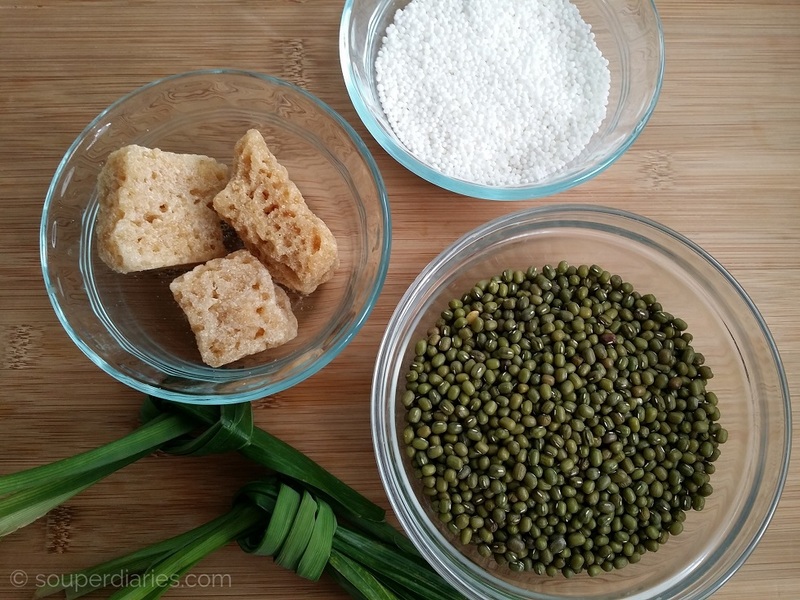 I have included the link to sago pearls and mung beans on the side. Lovely pictures here. I often used to cook mung bean soup, but didn’t know that it’s not suitable for those with cold hands and feet. I get cold extremities a lot, so I might steer clear of green bean soup for a little while! Would red bean soup have the same effect, or should that also be avoided by people like me? Thanks for your comments, Jolie. Red bean soup is another tasty dessert and is considered “yang” or warming food so it should not be a problem for you. Try to soak the red beans overnight or at least a few hours before cooking them. Another easy to make soup! This mung soup looks simply delicious. I have had the green bean soup before but not with the sago in it. My aunt is a big tapioca fan and whenever I used to visit she would make the green bean soup but with tapioca. It’s yummy sweet and I love the texture of the green bean in the sweet broth. Great to know that this soup is so beneficial for my health. I love that the bean is high in fiber and protein. I didn’t know it had lots of great B vitamins and all those minerals as well. This green bean soup is a keeper! I will be making it frequently. Love the idea of a dessert soup. I’ve been looking for a recipe to cook green beans for a while now. I think I was a bit discouraged as I thought I had to soak them overnight and always forgot. I will take you advice and soak only a few hours. Would 2 hours be enough? Thanks fro the practical printable format, I love it! Hi Carolyn, I would recommend soaking for about 4 hours or more if you wish to soak. Some believe that it is easier to digest and faster to cook if soaked prior to cooking. The next time I cook this soup, I’ll soak the beans overnight to see if there’s any difference and I’ll update it in my post. Thanks for your inquiry.